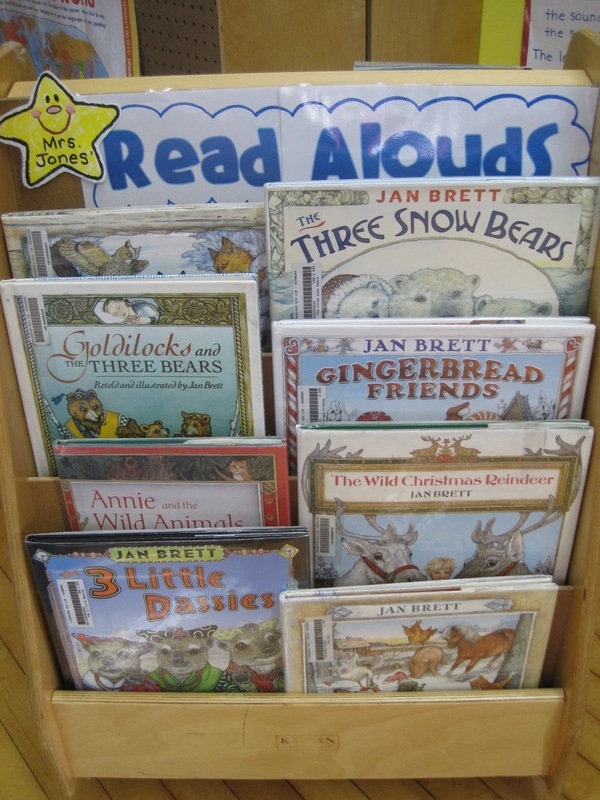 At the library today one of the kids picked up a book from the display and proudly declared, "Look Mrs. Jones... JAN BRETT!!!" You would have thought she was a 10 year old talking about Justin Bieber. 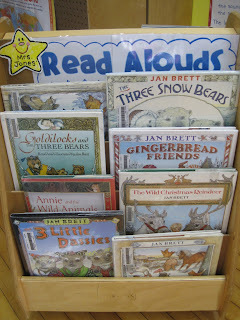 :) Needless to say, we just ended week 1 of our two week Author Study on Jan Brett... so Jan's books are a hot commodity. This week centered around The Mitten and The Three Snow Bears, with a few other titles sprinkled in. Next week is The Hat, The Wild Christmas Reindeer, and comparing/contrasting Snow Bears with Goldilocks. 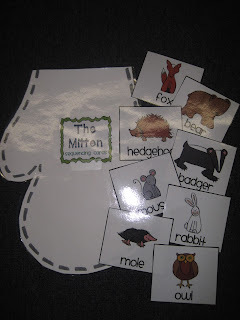 If you would like to use this in your classroom, you can find it here at my TpT shop! We will lead up to Christmas break having some fun with the Gingerbread stories, our first Field Trip to see Rudolph, and lots of holiday excitement. 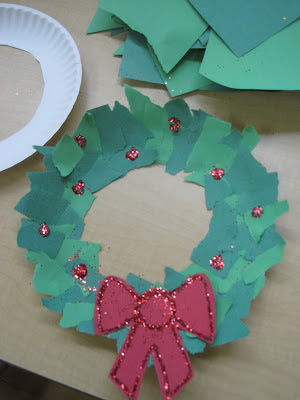 Here's our craft for next week, ripped paper wreaths. Doesn't everything look better with glitter? Super easy to make! Where are your CUTE animal pictures from for the mitten project? If they are yours -will you share? Thanks! Where do you find it on her website? I tried but did not come across it. Better yet! Thanks! One more question - Do you have them write the words correctly (animal names) or use sound spelling? For that activity I let them each pick whichever animal they wanted. It turned out about 3 children per animal, so I sent them off with their paper and the large animal card (from the first picture in my blog post). I had formatted the card with the animal name printed on it, so they were able to copy the animal name from the card. They kept the card in their group and used it to look at for their drawing... I would definitely suggest doing this because their illustrations came out so cute! I just tried commenting before, but I'm not sure it went through! I was interested to see if you have a "generic" story flip book available that could be used for all different stories. Do you have or sell the generic story flip book separately? Is there anyway to just get the Three Snow Bears activities. I do not need the rest. Sorry Rebecca, it is just part of the unit. 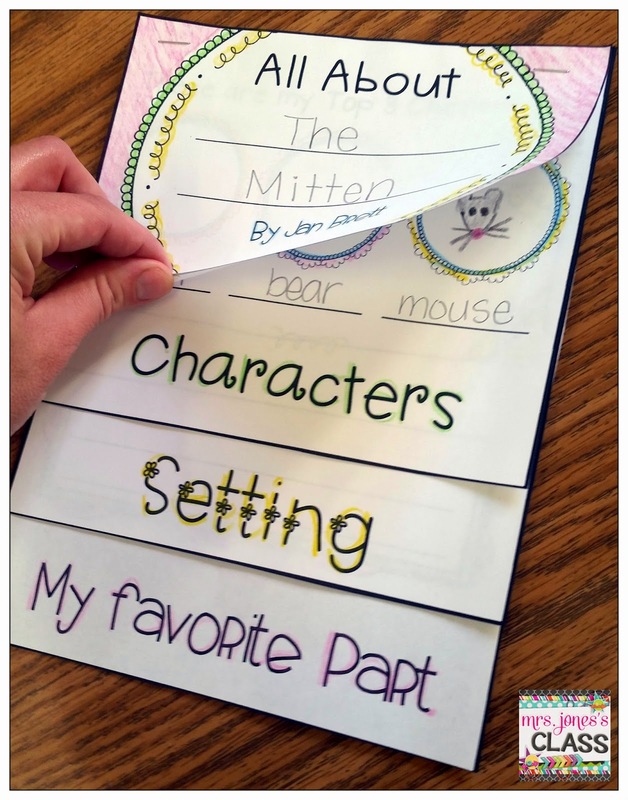 Subscribe and receive a free Guided Reading Teacher Toolkit. Thanks for signing up. Check your email to confirm and get your free Guided Reading Teacher Toolkit. Once you find the email, drag it into your primary inbox, if you have one, so that way you won’t miss out on more ideas for your classroom. Together, we’ve got this! What do I do on the first day of FIRST Grade? © 2015 Mrs. Jones's Kindergarten. Felicity Template designed by Georgia Lou Studios Customized by A Bird in Hand Designs All rights reserved.